If you have ever had a tooth knocked out, come loose, or pulled, your first thought is likely “how can I get this replaced?” Nobody wants a missing tooth, an unseemly gap in an otherwise welcoming smile. However, as you go through this journey called life it is very possible that you may find yourself with a missing tooth and unsure of what to do next. 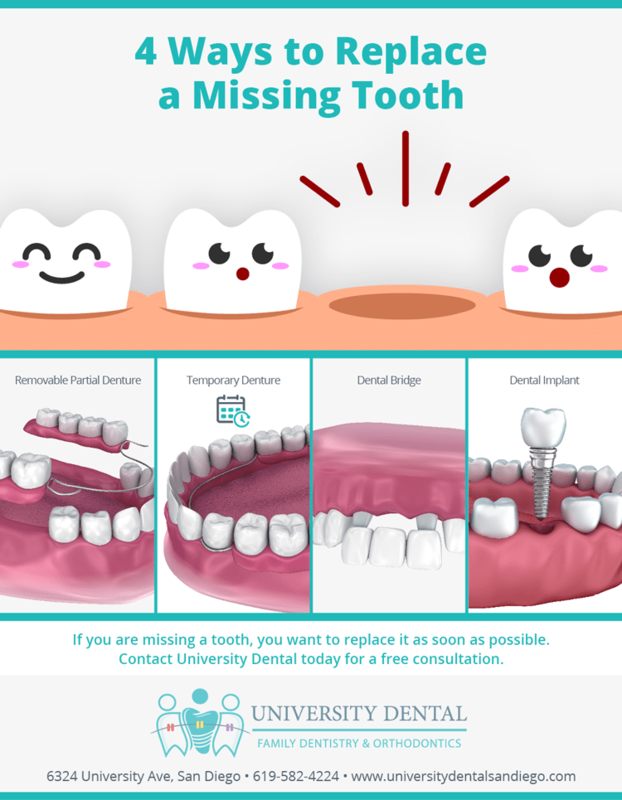 University Dental in San Diego specializes in replacing a missing tooth or teeth, and we provide 4 ways to replace a missing tooth. To learn more or to schedule a consultation, contact us today by calling (619) 582-4224. If you are missing one or a few teeth, you may want to opt for removable partial dentures. While the dentures do a great job of replacing your missing teeth, there are some limitations. The metal clasps holding removable partial dentures may be visible while you are smiling or speaking, and the dentures can even move a little when you speak or eat, causing some slight discomfort. The dentures also need to be cleaned in a soaking solution overnight. The primary advantage of removable partial dentures is they are a very affordable option and there is no need to adjust the surrounding teeth. 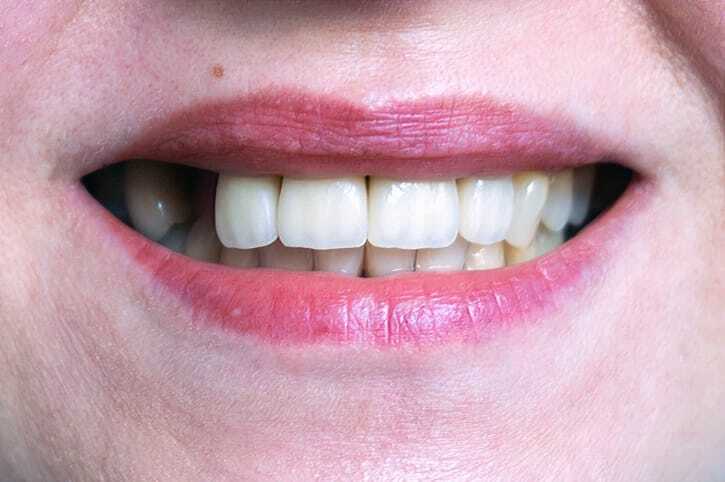 Temporary dentures, also called a “flipper”, are a great short-term solution for a missing tooth. Temporary dentures are usually used as a stopgap as the dental specialist waits for the site to heal enough to place a bridge or an implant. The implant flips in and out of the gap easily, hence the “flipper” nickname. Temporary dentures have a lot of common with removable partial dentures, with the main difference being temporary dentures are less expensive, intrusive, and sturdy. A dental bridge is a way to replace a missing tooth that requires adhering a fixed solution to the teeth surrounding the gap. The dental bridge is unlike the two denture options in that it cannot be removed, as it is cemented in the mouth. This provides a more permanent solution, allowing you to replace one or more teeth easily. The main downside of a bridge is that it requires cutting down the teeth surrounding the missing tooth or teeth to connect them together. A dental implant is a modern solution to a missing tooth, providing a tooth that looks and acts exactly like a normal tooth. The dental implant is placed directly into the root of the tooth, requiring no alterations to surrounding teeth. The dental implant is the best option for replacing a missing tooth, and if you are missing several teeth you want to go with the All-On-4 solution. If you do not replace a missing tooth, your mouth will attempt to fill the gap. To do so, the bone of the missing tooth slowly dissolves and the surrounding teeth shift inwards to fill in the gap. Not only does this make for some unsightly teeth, but it also makes cleaning your teeth harder and can lead to bone loss or tooth decay. If you are missing a tooth, you want to replace it as soon as possible. If you have a missing tooth, you should try to get it replaced as soon as possible. The team at University Dental in San Diego is trained in a variety of different tooth replacement techniques, and we will help you determine what is the best option for you. If you come in to University Dental, you can expect only the best dental treatment from our team of experienced dental specialists. If you are interested in learning more ort would like to schedule an appointment, contact us today by calling (619) 582-4224.